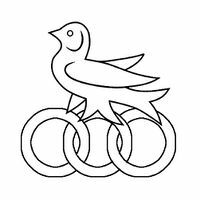 (Fieldless) In pale a martlet conjoined to three annulets interlaced argent. House Fulton is a small household from Malagentia headed by Lord and Lady Fulton. The rings of the Fulton martlet represent service, the arts & sciences, and martial activities. Adult members of the house have pearls adorning their pins, one for each area they participate in. The young children are given a leather disk with a martlet on one side and the contact information of the appropriate parent on the other. 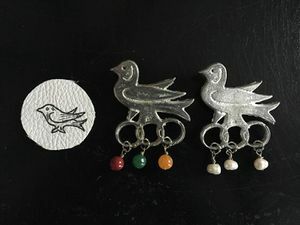 When the children of the house turn 13, they are given their own pin, however, instead of pearls, they are given beads to symbolize their areas of activity - red for martial, green for A&S, and yellow for service. When the children turn 18, they are given a new pin with pearls replacing the colored beads. Lord and Lady Fulton, having established their household on the edge of civilization on the border between England and Scotland, have searched the world for interesting individuals with whom to fill their hall. Now, this company travels with them through the lands of the Knowne World, keeping their house and making sure their property is protected. They are quite fond of meeting new people and we'd be happy to introduce you to them, just as soon as they get back from their walk. Or did they head to the archery range? Well, we just saw them at breakfast. We swear they are here somewhere. This page was last edited on 17 January 2019, at 13:13.